Elf and Leonx moved as if of one mind, taking advantage of the sudden onslaught to strike a decisive counterattack. The Elven riders brought their elegant glaives to bear as their mounts nimbly dodged the crude weapons of the tainted barbarians. None exemplify the primal, wild nature of the Verdelam more than the Leonx Riders. Charging into battle atop their ferocious Leonx, large felines native to the Aymhelin, these Elven warriors pierce through enemy lines with the force of a storm, only to use their lightning speed to evade counter-blows and change their angle of attack with the swiftness of a gale. Each half of the pair trusts each other with its life, and the bond a Leonx shares with its rider is akin to family. In battle, these wild riders coordinate their movements as one, fusing Elven skill with the predatory instincts of one of the most fearsome beasts in the world. As the battle for Terrinoth escalates, the Latari Elves leave the safety of the Aymhelin Forest to battle the forces of darkness that gather in the east. 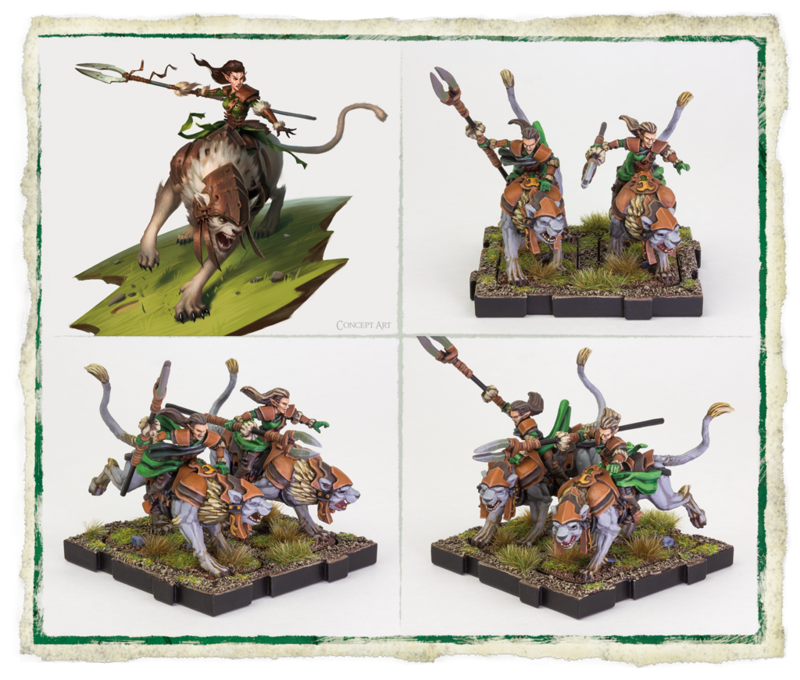 Before confronting the Uthuk Y’llan, we offer you a closer look at the Leonx Riders of the Latari Elves Army Expansion who, under the leadership of Aliana of Summersong, make up the cavalry of the Latari army. The Leonx Riders have lived on the fringe of Latari culture for centuries. While still scorned by the Eolam for their primal natures, these nomads represent the Latari’s most skilled and deadly warriors, embracing the Elves’ bond with the natural world rather than grieving their loss of the stars. They protect the most isolated Latari settlements as they roam freely throughout the realm, their natural cunning and skill in war making them quite fearsome to confront as they run down their prey. Above all, there is nothing that compares to the agility and adaptability of the Leonx Riders. Their command tool offers them the ability to move either early or late in each round and to cover great distances. None of the actions on the Leonx Riders’ modifier dial detract from their speed. This lends the Riders the unique ability to outflank enemy units and maneuver around terrain obstacles without slowing down. The Leonx Riders’ speed is complemented by their Impact 1 keyword, which inflicts a panic token on an enemy when the Riders collide with them during a charge. The Riders are built to move quickly and strike first, destroying enemies before they have a chance to defend. When participating in a melee attack, Leonx Riders roll one red die and two blue to increase their chances of rolling two surge icons. These can be spent to gain an additional hit in combat which can mean the chance of wiping out an additional infantry figure or be the boost necessary to inflict a wound on an enemy hero. Players who command the Riders may also choose to use their two surge icons for a unique surge action, a mortal strike, and inflict a wound. These high-impact options make the Leonx Riders deadly when given the first strike. 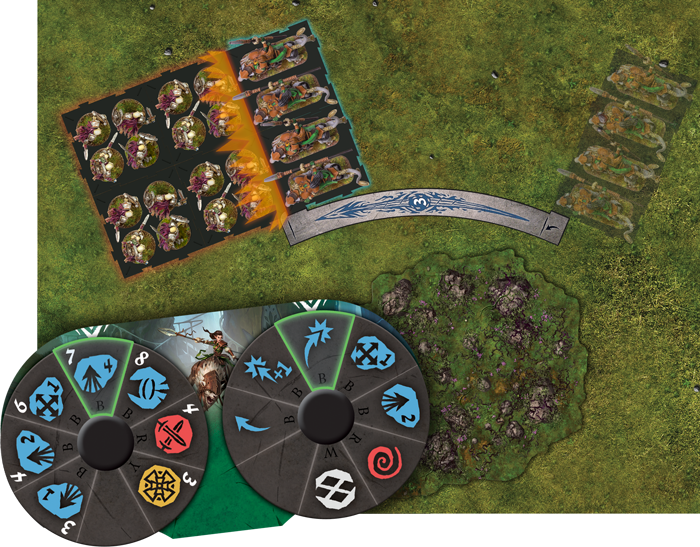 The Leonx Riders use the fastest turn tile to impact the Reanimates Spearmen! To this end, the Latari Elves Army Expansion comes with twelve available upgrade cards. 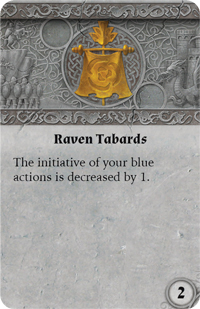 Among those, Raven Tabards decrease the initiative of the command tool’s blue actions by one. Employing this upgrade can give Leonx Riders the freedom to race across the board earlier in the round and strike at distant enemies right away, or to outflank an enemy already engaged in combat with an outnumbered ally and rescue them from imminent destruction. Now that the Latari have joined the fight for Terrinoth, the Leonx Riders are ready to set forth and turn the predatory Locust Hordes into prey. 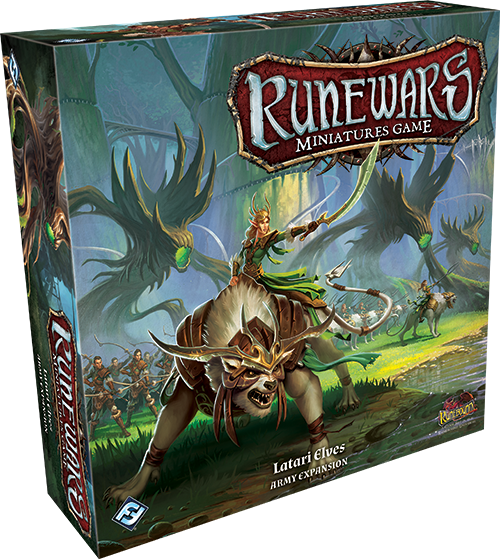 Add the Leonx Riders to your ranks, and preorder the Latari Elves Army Expansion (RWM14) at your local retailer today!